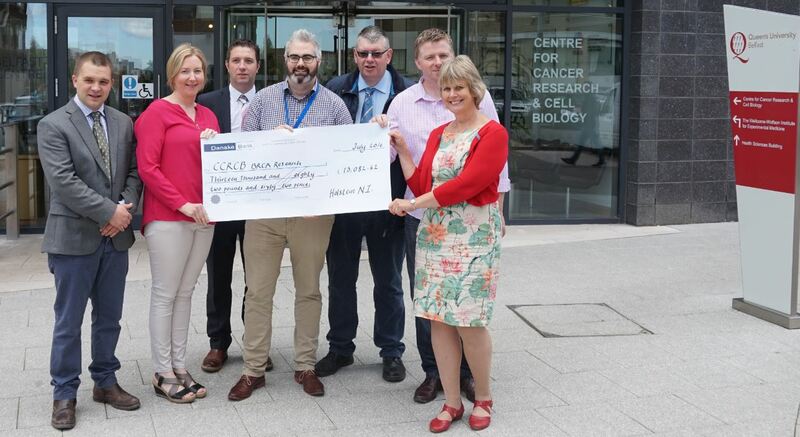 Over £13,000 has been donated to the Centre for Cancer Research and Cell Biology (CCRCB) at Queen’s. The money was raised at the inaugural Holstein NI Open Day and stock judging competition held at the end of April in Armagh. Open Day hosts Ivor and Cecilia Broomfield, and representatives of Holstein NI including breeders who donated and purchased the calves at auction, were welcomed to Queen’s for the cheque presentation by Dr Kienan Savage and by Head of Medical Fundraising, Helen Surgenor. Expressing his appreciation for the Holstein NI donation Dr Savage said: “On behalf of CCRCB I would like to thank everyone who contributed to the successful running of the Holstein NI Open Day. More than 400 visitors travelled from across the country to attend the Ecosyl-sponsored Open Day at the Broomfield family farm which is home to the 90-cow Moneyquin Herd. The event featured a host of agricultural trade stands, informative workshops, children’s entertainment, a cake stall and various competitions. One of the highlights was a charity auction, which included embryos and three pedigree Holstein calves, as well as numerous other items generously donated by local farmers and businesses. Speaking during the visit to CCRCB Ivor Broomfield said: “We have been overwhelmed by the generous support, and Cecilia and I are delighted that £13,082.62 has been raised for our nominated charity. The CCRCB Open Day on Saturday 22 October (11am-3pm) will showcase its state-of-the-art facilities and world-class innovative research. The itinerary includes talks and lab tours. For information on Holstein NI please contact Julie Hazelton tel: 07845 919597. General media inquiries to Gerry Power, Communications Officer, Queen’s Development and Alumni Relations Office, Queen’s University Belfast (tel: +44 (0)28 9097 5321). Photo caption (L-R): Derek Nelson, Ecosyl, Cecilia Broomfield, Holstein Club Chairman John Berry, Dr Kienan Savage (CCRCB), Club Secretary John Martin, Ivor Broomfield and Helen Surgenor.